Here it is ladies! The tool that I have been having fun with is made by Made Easy Incorporated® and is called the Create-a-cut™. I am literally bouncin' up and down with the little paper flourishes I have been creating. Look at these delicious little embellishments I have created in the last short while just slicing, dicing, punching and scoring. Have you been ogling the Doodlebug Paper Frills™? I certainly have and this is why I am over the top excited about this cutter!!! ETA: Many of you have asked where you can purchase one of these cutters. Please follow this link to find purchasing information. Below are a few samples I created using the cutter. The possibilities are ENDLESS!!! I find that this is so much more incredible than the frills only because I have a limitless variety of paper on which I can work my magic – WOOHOO! In this sample I used the Scallop blade together with the Classic blade. First I edged the Memory Box Key Lime card front, so that it would contrast with the white interior. 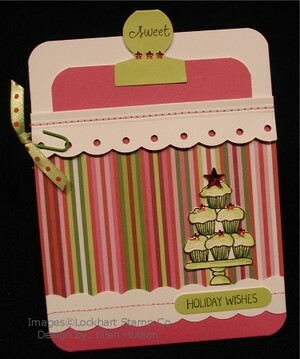 I then cut and scored the polka dot Memory Box Christmas Brights funky polka dot. Next I cut the strip of red using the Classic blade on both sides, mounting it on white cardstock, piercing it and adding the sparkly green KI Memories brads. What a funky little strip indeed. Next – do you see what I’m trying to convey with the group of cupcakes stamp? Juanita deserves a huge round of applause for pushing me over the edge on this one. Do you see the tree shape? I figured if I colored the cupcakes all green and added some little “star lights” with the star on top it would turn into a Christmas tree. What do you think? To make this pocket I once again used the Scallop blade. I guess I really like that one – LOL! I actually really like them all and so I find it hilarious that all my samples that I put together today focus on this blade. First I cut the top edge of the pocket fold, turning it down and punching the holes with my crop-a-dile. The crop-a-dile works fantastic for getting these holes pretty even. 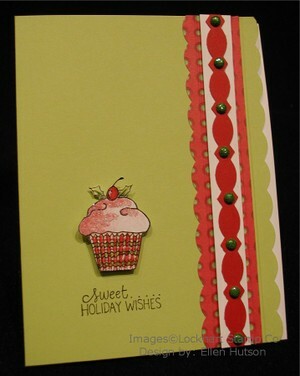 This is when the Memory Box two-sided cardstock is fantastic – look at that awesome color contrast! Then I scored the front of the fold with the Scor-It and sewed between the two lines. I also cut the lower white strip with the Scallop blade, but just sewed it to the card front after attaching my patterned KI Memories paper.